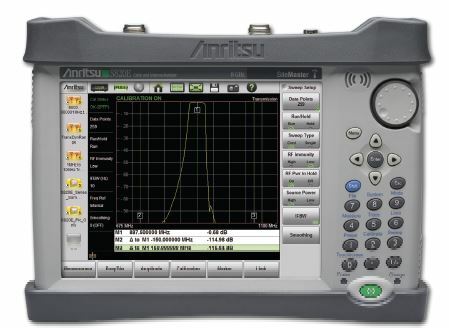 Anritsu’s Site Master™ S820E is the highest performance, rugged, hand-held microwave cable/antenna analyzer covering 1 MHz to 40 GHz range. Utilizing the latest advancements in NLTL technology, the S820E architecture enables benchtop performance in a portable package. Features include a large outdoor-viewable touch screen display, 6 hour typical battery life, intuitive GUI, and classic mode that mimic the S820D basic measurement flow. Standard extendable USB sensor transmission measurements provide a scalar analyzer-like functionality. VNA and Vector Voltmeter options make this microwave cable/antenna analyzer ideal for field installation, troubleshooting, and maintenance of coaxial and waveguide systems. High value pricing and flexible configuration…the Microwave Site Master S820E significantly increases efficiency in the field. For more information on the S820E handheld cable and antenna analyzer, download the datasheet or contact Anritsu.